In May 2009 I ventured to Switzerland to see an RhB (Rhätische Bahn) steam working from Landquart to Filisur via Davos. As it turned out I found the day to day RhB operations just as interesting as the steam tour, so much so that I came back later in the year for a full long weekend. Because of work commitments this was just an out Saturday morning / back Sunday evening weekend, flying Easyjet from Luton to Zurich. We stayed at the Hotel Grishuna, next to the station in Filisur (where else? ), spending Saturday afternoon on a lengthy walk to, firstly, the Landwasser Viaduct (which was covered in scaffolding and cladding for refurbishment) and then on to Davos Wiesen, before returning by train. On our walk through the forest we saw a Spotted Nutcracker, the first time I'd encountered this member of the crow family which is generally absent from GB. I had published these pictures on my old fotopic site but have only now got round to resurrecting them, some 10 years after they were taken! An early morning flight from Luton and a drive from Zurich got us to Filisur in time for lunch. 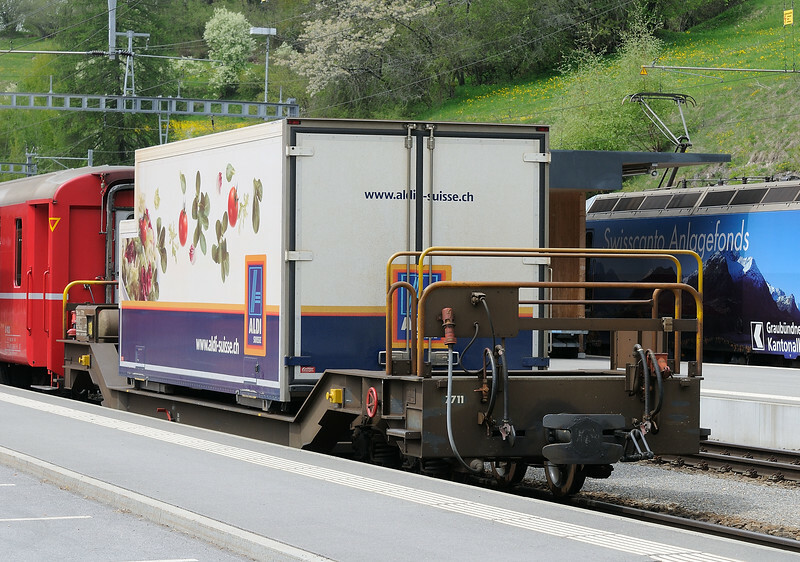 An Aldi container brings up the rear of a St Moritz to Chur service. On the other platform a connecting service to Davos Platz awaits.